I'm excited to share an image of the new OSHA Fact Sheet entitled "PPE Selection Matrix for Occupational Exposure to Ebola Virus." My last blog post showed the process for donning and doffing PPE in support of the CDC Guidelines, and starred my team at Sock Puppet Safety. An image of the PPE selection matrix is shown below - it looks a bit daunting until you see how it is separated out by task. 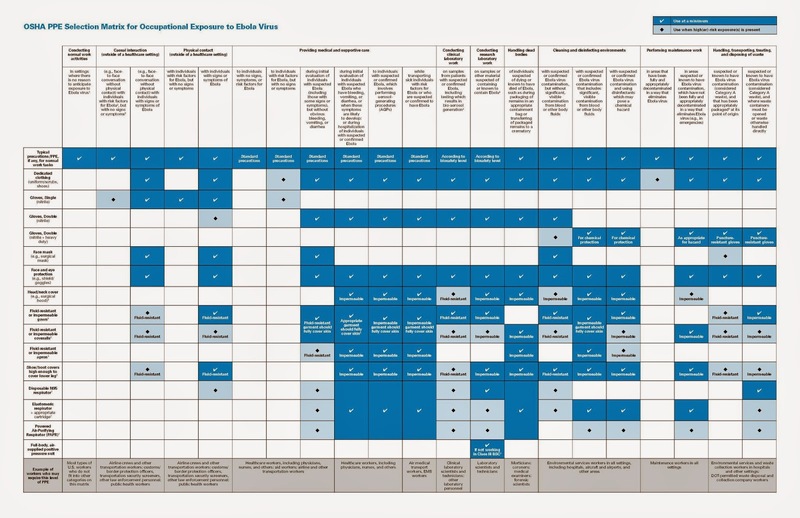 OSHA's PPE Selection Matrix for Occupational Exposure to Ebola Virus. The list above is the kind of PPE that would be worn by environmental services workers or waste collection workers in hospitals and other settings, as well as DOT-permitted waste disposal and collection company workers. Thanks to OSHA for providing such a useful resource!